1. 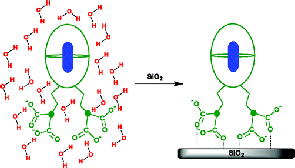 Excited state chemistry of capsular assemblies in aqueous solution and on silica surfaces. E. Ramasamy, N. Jayaraj, M. Porel and V. Ramamurthy, Langmuir, 2012, 28 (1), 10-16. Link. 2.. Capsular complexes of nonpolar guests with octa amine host detected in the gas phase. J. P. Da Silva, R. Kulasekharan, C. Cordeiro, S. Jockusch, N. J. Turro and V. Ramamurthy, Organic Letters, 2012, 14(2), pp 560–563. Link. 3. 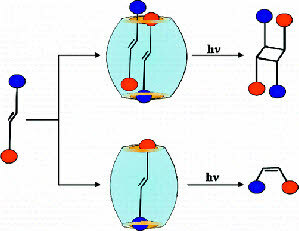 Photoinduced electron transfer between a donor and an acceptor separated by a capsular wall. M. Porel, S. Jockusch, A. Parthasarathy, V. J. Rao, N. J. Turro and V. Ramamurthy. Chem. Commun., 2012, 48, 2710-2712. Link. 4. Dynamic internal cavities of dendrimers as constrained media. A study of photochemical isomerizations of stilbene and azobenzene using poly(alkyl aryl ether) dendrimers. B. Natarajan, S. Gupta, N. Jayaraj, V. Ramamurthy and J. Narayanaswamy. J. Org. Chem., 2012, 77 (5), pp 2219-2224. Link. 5. Photoinduced electron transfer across a molecular wall: Coumarin dyes as donors and methyl viologen and TiO2 as acceptors. M. Porel, A. Klimczak, M. Freitag, E. Galoppini and V. Ramamurthy. Langmuir, 2012, 28 (7), 3355-3359. Link. 7. Deep Cavitay- cavitand Octa Acid as a Hydrogen Donor: Photofunctionalization with Nitrenes Generated from Azidoadamantanes. Choudhury, R.; Gupta, S.; Silva, Da, P. J.; V. Ramamurthy.7. J. Org. Chem. 2012, ASAP. Link. 8. Gold Nanoparticles Functionalized with Deep-Cavity Cavitands: Synthesis, Characterization, and Photophysical Studies Shampa R. Samanta, Revathy Kulasekharan, Rajib Choudhury, Pradeepkumar Jagadesan, Nithyanandhan Jayaraj, and V. Ramamurthy, Langmuir, 2012, Link. 9. Ultrafast Photoinduced Electron Transfer between an Incarcerated donor and a Free Acceptor in aqueous Solution. Porel, M.; Chuang, H. C.; Burda, C.; Ramamurthy, V. J. Am. Chem. Soc. 2012, 134(36), 14718-14721. Link. 1. 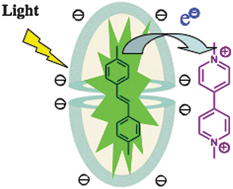 Steric and Electronic Effects in Capsule-Confined Green Fluorescent Protein Chromophores. Anthony Baldridge, Shampa R. Samanta, Nithyanandhan Jayaraj, V. Ramamurthy, and Laren M. Tolber, J. Am. Chem. Soc., 2011, 133 (4), 712-715. Link. 2. 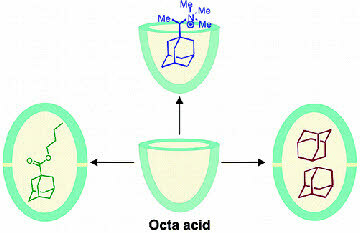 Dynamics of capsuleplex formed between octaacid and organic guest molecules — Photophysical techniques reveal the opening and closing of capsuleplex. Jayaraj, Nithyanandhan; Jockusch, Steffen; Kaanumalle, Lakshmi S.; Turro, N. J.; Ramamurthy, V. Can. J. Chem. 2011, 89(2): 203–213. Link. 3. Restricted rotation due to the lack of free space within a capsule translates into product selectivity: photochemistry of cyclohexyl phenyl ketones within a water-soluble organic capsule. Revathy Kulasekharan, Rajib Choudhury, Rajeev Prabhakar and V. Ramamurthy, Chem. Commun., 2011, 47, 2841-2843. Link. 4. Photodimerization of HCl salts of azastilbenes in the solid state. Barnali Mondal, Burjor Captain and V. Ramamurthy, Photochem. Photobiol. Sci., 2011, 10, 891-894. Link. 5. Aggregates of Cucurbituril Complexes in the Gas Phase. Jos P. Da Silva, Nithyanandhan Jayaraj, Steffen Jockusch, Nicholas J. Turro, and V. Ramamurthy. Organic Letters, 2011, 13 (9), pp 2410–2413. Link. 6. 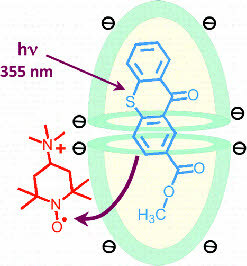 Ultrafast singlet-singlet energy transfer between an acceptor electrostatically attached to the walls of an organic capsule and the enclosed donor. S. Gupta, A. Adhikari, A. Kr. Mandal, K. Bhattacharyya and V. Ramamurthy, J. Phys. Chem. C, 2011, 115 (19), pp 9593-9600. ASAP. Link. 7. Role of free space and weak interactions on geometric isomerization of stilbenes in a confined space. A. Parthasarathy and V. Ramamurthy, Photochemical & Photobiological Sciences, 2011, 10, 1455- 1462. Link. 8. Interfacial regions governing internal cavities of dendrimers. 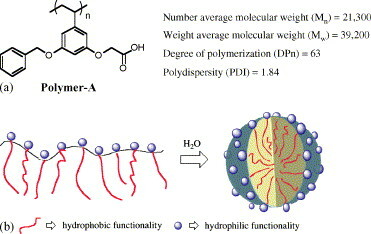 Studies of poly (alkyl aryl ether) dendrimers constituted with linkers of varying alkyl chain length. Baskar Natarajan, Shipra Gupta, V. Ramamurthy, and N. Jayaraman. J. Org. Chem., 2011, 76 (10), pp 4018–4026. Link. 9. 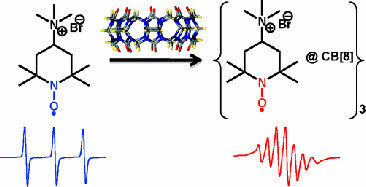 Interaction between encapsulated excited organic molecules and free nitroxides: Communication across a molecular wall. Mintu Porel, Steffen Jockusch, M. Francesca Ottaviani, N. J. Turro and V. Ramamurthy. Langmuir, 2011, 27 (17), pp 10548–10555. Link. 10. New water-soluble organic capsules are effective in controlling the excited processes of guest molecules. R. Kulasekharan and V. Ramamurthy. Organic Letters, 2011, 13(19), pp 5092–5095. Link. 11. Chemistry in restricted spaces. Select photodimerizations in Cages, Cavities, and Capsules. V.Ramamurthy and A. Parthasarathy. 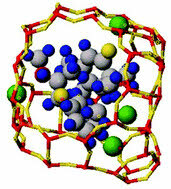 Israel Journal of Chemistry, 2011, 51(7), pp 817–829. Link. 12. Photochemical generation and reactivity of carbenes within an organic cavitand and capsule: Photochemistry of adamantanediazirines. S. Gupta, R. Choudhury, D. Krois, G. Wagner, U. H. Brinker and V. Ramamurthy. Organic Letters, 2011, 13(22), pp 6074–6077. Link. 13. 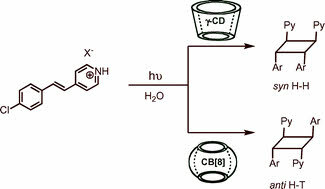 CIDEP from a polarized ketone triplet state incarcerated within a nanocapsule to a nitroxide in the bulk aqueous solution. S. Jockusch, M. Porel, V. Ramamurthy and N. J. Turro. J. Phys. Chem. Lett., 2011, 2 (22) , pp 2877–2880. Link. 1. 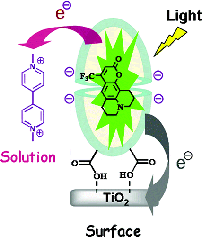 Activation of fluorescent protein chromophores by encapsulation. A. Baldridge, S. R. Samanta, N. Jayaraj, V. Ramamurthy and L. M. Tolbert, J. Am. Chem. Soc., 2010, 132, 1498. Link. 2. Guest rotations within a capsuleplex probed by NMR and EPR techniques.R. Kulasekharan, N. Jayaraj, M. Porel, R. Choudhury, A. K. Sundaresan, A. Parthasarathy,M. F.Ottaviani, S. Jockush, N. J. Turro and V. Ramamurthy, Langmuir, 2010, 26, 6943. Link. 3. 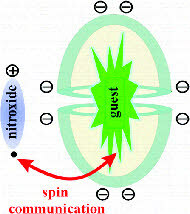 Electron Spin Polarization transfer from a nitroxideincarcerated within a Nano-capsule to a nitroxide in a bulk solution. S.Jockush, O.Zeika, N.Jayaraj. V.Ramamurthy, N.J. Turro, J.Phys.Chem. Letters, 2010, 1, 2628-2632. Link. 4. A closed nano-container enables thioketones to phosphoresce at room temperature in aqueous solution. N. Jayarjaj, M. V.S. N. Maddipatla, R. Prabhakar, S. Jockush, N. J. Turro and V. Ramamurthy, J. Phys. Chem. B, 2010, 114 (45), 14320-14328. Link. 5. Thiourea as a Template for photodimerization of azastilbenes. B. R. Bhogala, B. Captain. A. Parthasarathy and V. Ramamurthy, J. Am. Chem. Soc., 2010, 132 (38), 13434-13442. Link. 6. Suppression of spin-spin coupling in nitroxide biradicals by supramolecular host-guest interactions. M. Porel, M. F. Ottaviani, S. Jockush, N. Jayaraj, N. J. Turro and V. Ramamurthy, Chem. Comm. 2010, 46, 7736-7738. Link. 7. Chemistry in confined spaces: High energy conformer of a piperidine is favored within a water Soluble capsuleplex. M. Porel, N. Jayaraj, S. Raghothama and V. Ramamurthy, Organic Letters, 2010, 12(20), 4544. Link. 3. Chiral Photochemistry within a Confined Space: Diastereoselective Photorearrangements of a Tropolone and a Cyclohexadienone Included in a Synthetic Cavitand. 5. Chiral Photochemistry within Natural and Functionalized Cyclodextrins: Chiral Induction in Photocyclization Products from Carbonyl Compounds. 6. 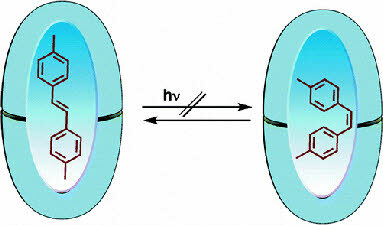 Chiral photochemistry in a Confined space: Torquoselective Photoelectrocyclization of Pyridones within an Achiral Hydrophobic Capsule. 8. 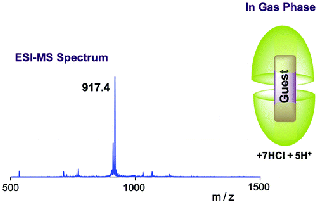 Self Aggreration of supramolecules of Cucurbituril and Nitroxides Revealed by EPR Spectra. 1. Templation of the Excited State Chemistry of a-(n-alkyl)-dibenzylketones: How Guest Packing within a Nanoscale Supramolecular Capsule influences Photochemistry. 2. An EPR and NMR study of supramolecular effects on paramagnetic interaction between a nitroxide incarcerated within a nanocapsule with a nitroxide in bulk aqueous phase. 3. Consequences of Controlling Free Space Within a Reaction Cavity With a Remote Alkyl Group: Photochemistry of para-Alkyl Dibenzyl Ketones Within an Organic Capsule in Water. 1. A Styrene Based Water Soluble Polymer as a Reaction Medium for Photodimerization of Aromatic Hydrocarbons in Water. 2. A Latent Photoreaction Enhanced Upon Cyclodextrin Encapsulation: Photochemistry of a-Alkyl dibenzyl ketones in Water. 3. Photo-Fries Reaction in Water Made Selective With a Capsule. 4. 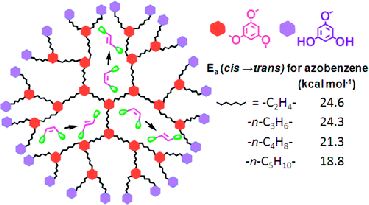 Templating Photodimerization of trans-Cinnamic Acid Esters with a Water Soluble Pd-nanocage. 5. Photodimerization of Acenaphthylene Within a Nanocapsule: Excited state lifetime dependent dimer selectivity. 6. Controlling Photoreactions with Restricted Spaces and Weak Intermolecular Forces: Exquisite Selectivity during Oxidation of Olefins by Singlet Oxygen. 7. Value of Zeolites In Asymmetric Induction During Photocyclization of Pyridones, Cyclohexadienones and Naphthalenones. 8. Pre-orientation of olefins towards a single photo-dimer: Cucurbituril mediated photodimerization of protonated azastilbenes in water. 9. 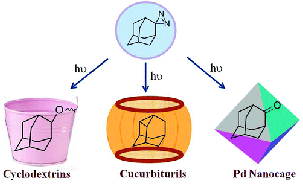 Reaction Cavity Features Affect Photoproduct Selectivity: Photodimerization of Stilbazolium Salts within g-Cyclodextrin and Cucurbituril. 10. Making a difference on excited state chemistry by controlling free space within a nanocapsule: Photochemistry of 1-(4-alkylphenyl)-3-phenylpropan-2-ones. 11. Controlling Photochemical Geometric Isomerization of a Stilbene and Dimerization of a Styrene Using a Confined Reaction Cavity in Water.